Ankle arthrodesis is a common procedure used to surgically treat end stage arthritis or as a salvage operation to improve function. The main goals of ankle arthrodesis (ankle fusion) is to relieve pain and maintain function. Ankle arthritis is degeneration of the cartilage that covers the ends of the bones that form the ankle joint. These bones are the tibia, fibula and the talus. Pain is typically made worse with movement of the arthritic ankle therefore a fusion sets the ankle in one position eliminating motion and reducing pain from the arthritic joint. Conservative treatment options include anti inflammatories, reduced activity, steroid or suplasyn injections, footwear modifications or braces and walking aids. Unfortunately all conservative treatment options will not reverse the arthritic changes in the ankle but can manage symptoms for a number of years if necessary. If other small joints in the foot are relatively well preserved an ankle fusion may be deemed the most appropriate surgery as it has a high level of success as well as patient satisfaction. The surgeon will determine which method is the most appropriate as some ankle fusions can be done arthroscopically (through a camera in the ankle joint) where some fusions may need to be undertaken as an open procedure. 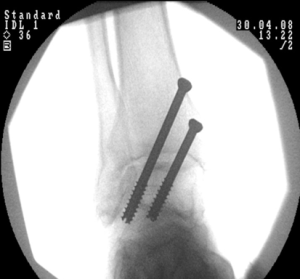 Regardless of the surgery undertaken a mixture of screws or screws and plates will be used to fuse the ankle joint. Any remaining cartilage will be removed during the operation and the surgeon will fix the ankle joint in the optimum position before he uses any of the final metalwork to fuse the joint. It is important to point out that an ankle fusion will eliminate any up and down motion available at the ankle joint but patients will be able to move the ankle in and out as this utilises motion available in a lower joint. The patient will be in a non weight-bearing cast for a period of at least 6 weeks which will be changed 10 days after the operation. The sutures used are generally dissolvable but sometimes if the surgeon is worried about wound healing other sutures may be used and will be removed approximately 4 weeks post operatively by a local nurse of plaster nurse if appropriate. It is important that the patient spends the first 10-14 days resting as much as possible elevating the leg at all times to reduce swelling and pain where possible. x-rays will be taken at 6 weeks to determine whether or not there has been a successful fusion and some times an extended period is needed in cast to ensure a solid fusion.